• Great for thicker, heavy weight clothing such as cold weather clothing. As one of our most popular styles, our Heavy Weight Break-Resistant 17 inch Black Plastic Dress Hangers are heavy duty and break resistant to withstand even the most severe use. Designed from K-Resin, the plastic dress hangers have a securely anchored, bright metal swivel hook to save space on clothing racks. They also feature notched shoulders to securely hold the straps of any size or style dress. 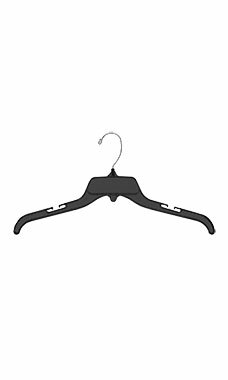 These heavy duty break-resistant plastic hangers are a wise and practical choice for your clothing display needs, sold in cases of 100.